Well, the local Homebrew Society meetings @brewstore continue to get a bit more structured and organised. The back room of the shop is just not big enough to house us all, so we’re moving to a bigger venue. We now have information sheets to fill in (see below) and apparently more plans in the pipeline. Exciting times! Anyway, as part of this move to elevate a perfectly pleasant, if somewhat busy, drinking session into something more respectable, July will be the second month in which a theme has been set. 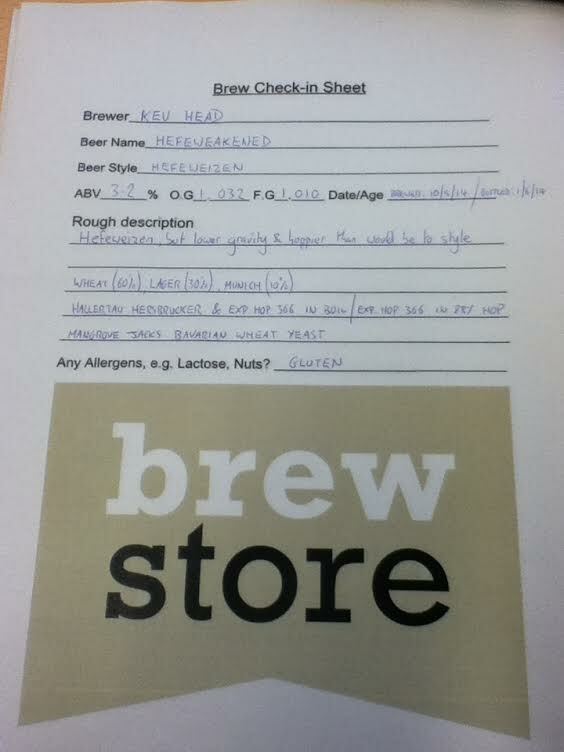 For July we’ve been asked to brew a beer using a single hop variety. It was a pretty uneventful brewday, all went smoothly and according to plan really. The Palisade smelt great and surprisingly punchy in the bag but, in the end, was less obvious in the finished wort than we were expecting from that aroma. Tasted promising, just not as hop-forward as we’d anticipated from the smell. The Carafa III in the mash ended up giving a great colour and we picked up some, but not too much, roastiness from that. All boding well prior to pitching anyway. We are still looking to try something new brewing-wise wherever possible just now, so this brew was our first time using liquid yeast (WLP001). Having heard nothing other than how it can make a massive difference to the finished product, we thought we’d give it a whirl. Certainly after 24 hours, the fermentation vessel was positively bulging and there was lots of krausen forming, so it’s definitely working. So, that’s Bonnington – a Palisade Black IPA – doing it’s thing. Will update on progress as and when. Thanks for reading, any comments are more than welcome. This entry was posted in Uncategorized and tagged BIAB, BIPA, homebrew, Palisade, WLP001 on June 10, 2014 by bagboilbeer.